Built in microphone with 8 second recording. Keeps you pet on a regular feeding schedule. Ice can be added to the top tray then simply align with the canned food or treat size sachets to the compartment below, this will keep the food cold until feeding time. Suitable for small sized pets. Compact design thus being a space saver. Quick convenient feeding on time with precise amounts of food. Only available in one colour: Granite White. Box Dimensions in cm: 32.4 x 32.4 x 12.8. Bowl diameter in cm: 25.6. App Remote Operation. It�s very easy to set the feeding time, feeding meals, feeding portions on the APP. 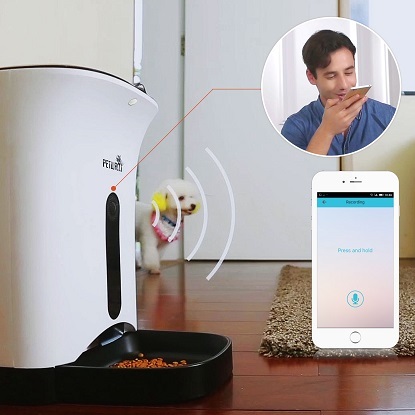 You can interact with your pets wherever you are via this APP. HD Camera. 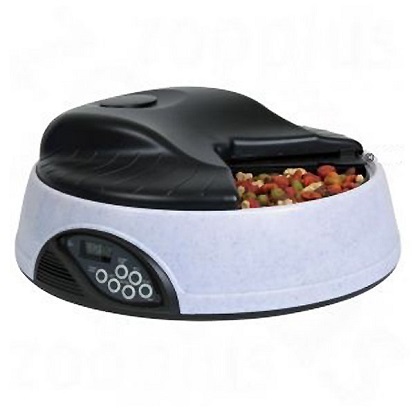 There is a 120 degree 1 Mega Pixel camera installed in the pet feeder, which can support the pet feeder to record va video and take a picture in all directions. Real Time Sharing. You can share pictures and videos on various Social Media Platforms like Facebook, Twitter, Wechat and QQ, which could attract people�s attention on all the good times you have with your pets. Voice Interaction. 10 seconds of voice recording function which can call your pets to eat food on time, which is the same as when you are at home. Memory Function. The parameters won�t be lost when the setting is done. The setting parameters will be saved even in the case of a power failure and will still be valid when the power comes on again. Unit works even is disconnected from Wi-Fi, it has a setting to switch to �Offline Feeding Mode� and feeds according to your program schedule. Unit runs on mains power or batteries. Keeps your pet on a regular feeding schedule. 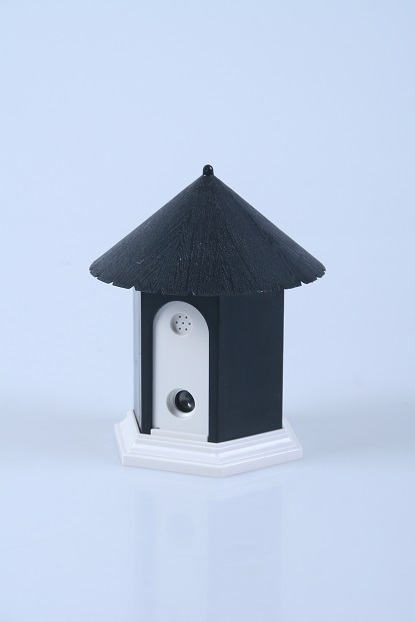 Suitable for pellet style food only. Suitable for small and medium sized pets. User programmable feeding times and volumes. Dispenses a minimum of 30g and a maximum of 100g per serving. App allows you to: monitor the amount of food served, select meal portions, feed your pet remotely, give real-time talkback, receive notifications. Real-time 1 megapixel camera lets you watch and talk to your pet and monitor pets activity in the daylight. Tamper proof locks on lid, pets cannot tamper with food. Only available in one colour: White. Box Dimensions in cm: 41 x 27 x 21. Each food compartment holds 330ml of food. Box Dimensions in cm: 32.4 x 32.4 x 11.3. 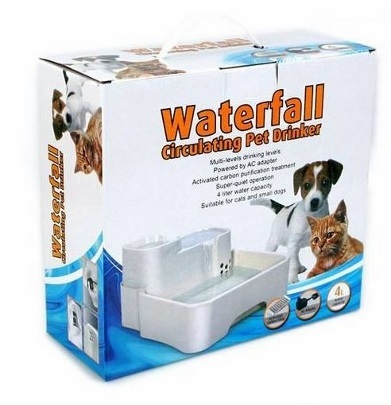 Provides pets with Fresh, Clean and Filtered Running Water. Flowing water encourages animals to drink water more frequently. Adds oxygen into the water. 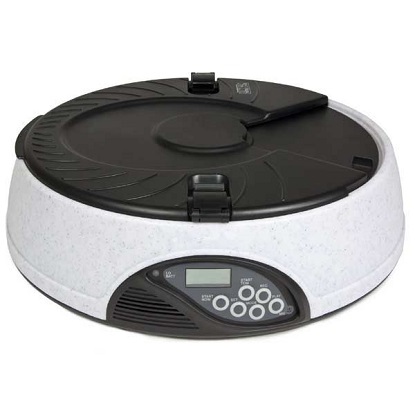 Constant circulation and filter helps inhibit bacteria growth. Helps reduce urinary infections in cats. Comes apart easily and easy to clean. Holds 4 litres of water. Cord is 150cm in length.